Valentino Dixon started drawing golf courses to keep his mind from atrophying. It caught the attention of Golf Digest. The rest is incredible history. Valentino Dixon doesn’t look like a man about to turn 50. Maybe it’s his wrinkle-less face. Maybe it’s his body, which any 30-year-old would be proud of. Maybe it’s his unfettered smile. Dixon has good reason to be buzzing. 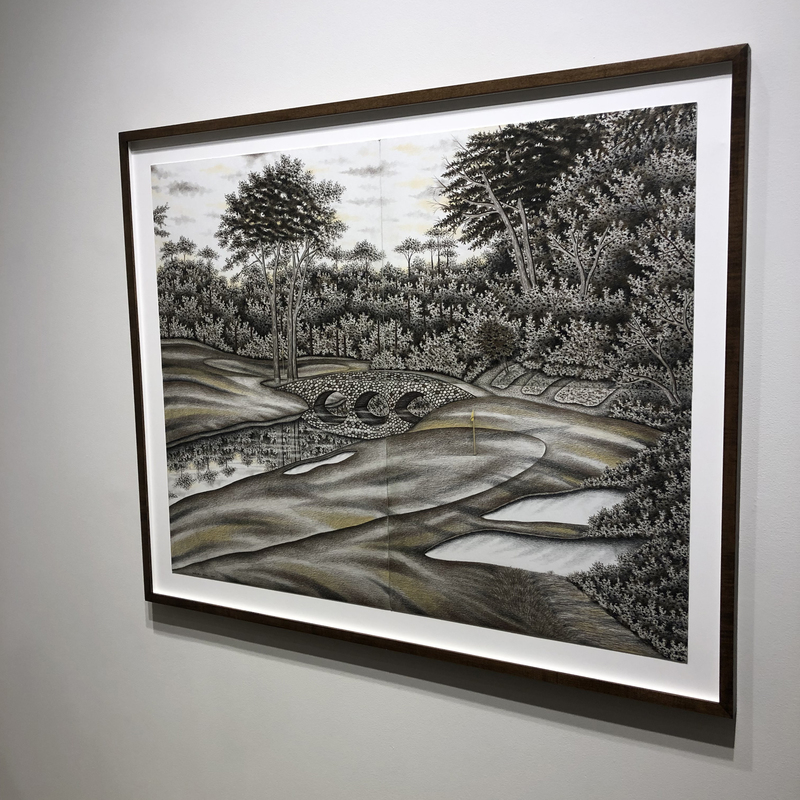 Patrons are packed into a swanky art gallery in Manhattan’s Lower East Side to see his drawings of golf courses. It’s his first solo show and this is, by anyone’s standards, an impressive debut. Twentyish works adorn the bright white walls. A motley crew inspects them—country clubbers in quarter-zips advertising hyper-private courses, grungy hipsters who frequent these types of gatherings and everything in between. The man of the hour mingles energetically with the crowd. A hello here, a picture there. He knows he’s as big an attraction as his art. As he drinks it all in, clearly excited but also a bit nervous, Valentino Dixon isn’t carrying himself like a 49-year-old artist at his own solo exhibition. And he certainly isn’t carrying himself like a man who spent 27 years in prison for a murder he didn’t commit. Back then, Dixon was something of an authoritative figure on the Buffalo streets. He was an established drug dealer, he’d been arrested multiple times and he owned three cars. In a prideful showdown, he was someone you wanted on your side. Despite being out on bail from a weapons charge, Dixon pulled up to a neighborhood hangout spot to back up his kin. At some point, a physical altercation broke out. Dixon remembers being off in a convenience store, buying a beer, when he heard the unmistakable pop pop of a firearm. Mario Jarmon, a friend of Dixon’s half-brothers, had been shot. Sometime after that, another acquaintance of the half-brothers, LaMarr Scott, biked home to grab a newly purchased semi-automatic weapon. He returned and shot 17-year-old Torriano Jackson to death. This is much different than the narrative established by the prosecution. (Again, Golf Digest did virtually all of the legwork to uncover this). The crux of the case against Dixon was statements from three young men at the scene. Emil Adams identified Dixon as the person who shot Jackson, which led to Dixon’s arrest. John Sullivan, who too was shot during the melee, also said Dixon killed Jackson. And Aaron Jackson, whose brother was murdered, chose one mugshot out of a series of six but said he couldn’t be sure who shot his brother because it happened so fast. Others recalled things differently. The same night that police visited Aaron Jackson, Scott confessed to local television that he shot and killed Torriano Jackson. “I was scared,” he told the reporter. In January 1992, Mario Jarmon—the first man shot at the melee—and Leonard Brown, another man at the scene, told a grand jury that Scott had fired the fatal shots. But by that point, it seems the police and the D.A.’s office weren’t exactly receiving all information with open arms. They’d already zeroed in on a subject: Valentino Dixon. He had been arrested and remained incarcerated while the investigation played out. 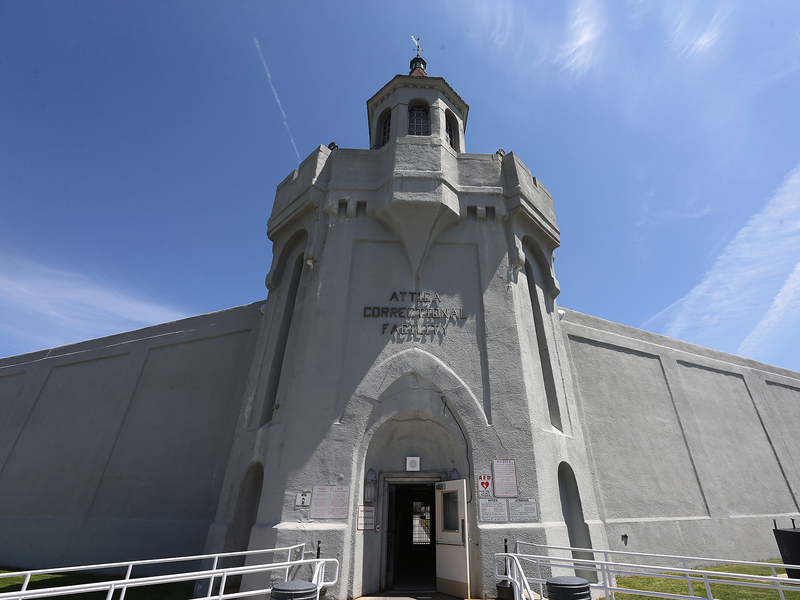 Attica Correctional Facility, the prison Valentino Dixon called home for 27 years. “Nothing new here,” says Marc Morjé Howard, a Georgetown Law professor who oversees a program to investigate wrongful convictions. His students were instrumental in getting Dixon released. More on that in a bit. Dixon’s murder trial began in 1992, and calling it shoddy would be too kind. Because Jarmon and Brown were charged with perjury, Dixon’s defense lawyer, Joseph Terranova, did not call them to the stand. In fact, Terranova didn’t call anyone to the stand. He also waived the right to an opening statement, both highly unusual moves in a murder trial. “Utterly, utterly incompetent,” Howard says. Dixon, understandably, believes more sinister motives were at play. Despite the simple fact that no physical evidence linked him to the crime—the murder weapon was never recovered—an all-white jury convicted Dixon of second-degree murder. He was sentenced to 39 years-to-life in prison. He was 22 years old. During his time at the infamous Attica Correctional Facility in western New York, Dixon developed a reputation as an artist. It was nothing new for him. He had attended a performing arts high school before opting for the more nefarious (and lucrative) dealer life. After a 10-year hiatus from art—three years of street life, seven years of tirelessly appealing his conviction—he picked up a colored pencil once again. It was a way to keep his mind from atrophying. Soon he was drawing every single day for up to 10 hours. 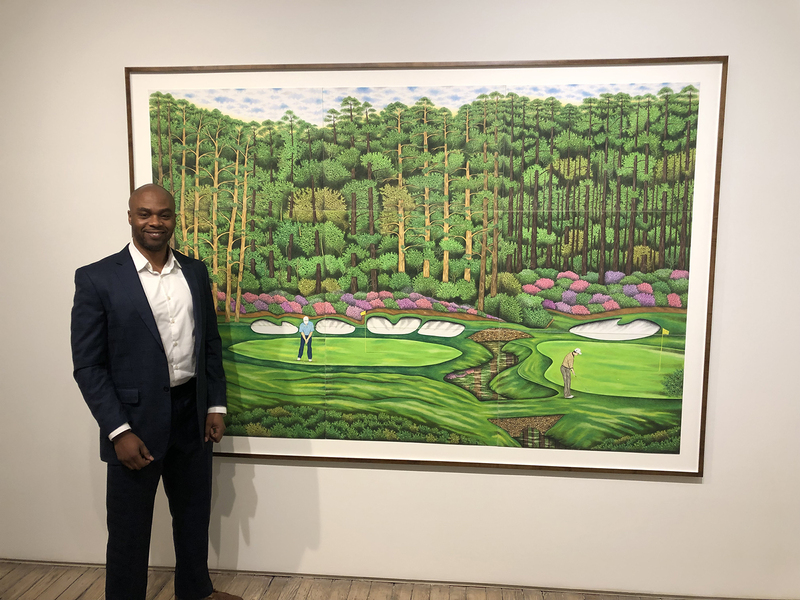 On an otherwise nondescript afternoon—they tend to bleed together when you’re serving a life sentence—the prison warden asked Dixon to paint his favorite golf hole, the par-3 12th at Augusta National. In hindsight, that request was the first in a long string of events that led to exoneration. “Never in a million years did I even think about golf before then, let alone play it,” Dixon says. But the tranquility of the picture hearkened back to childhood memories of fishing with his father in Canada, well before the trouble started. So he kept on drawing pictures of golf courses around the world. Some were depictions of what he saw in magazines and on the eight-inch television he purchased while incarcerated—Pebble Beach and Augusta were the most common inspirations—while others were courses he synthesized in his head. Eventually, and out of necessity, he developed a distinct style—idyllic scenes, with complex color layering that makes a drawing look like a painting. Frustrating prison restrictions made traditional painting unfeasible. Inmates were allowed acrylic paint but not oil paint. Canvas was allowed, but the wooden planks needed to stretch canvas weren’t. After some trial and error, Dixon settled on his tools of choice: a thicker drawing board and colored pencils. Simple as that. It’s what he uses to this day. As Dixon’s drawings improved and grew more painting-like, he began sending them to Golf Digest, but it was a letter that succeeded in getting the attention of Digest editorial director Max Adler. After reading the letter, in which Dixon proclaims his innocence, Adler was admittedly intrigued but dutifully skeptical. Inmate Claims Innocence—we’ve seen that movie before. So he went to Attica to meet with Dixon, and their conversation convinced Adler that a grave injustice had occurred. He published Dixon’s story under "Golf Saved My Life" in May 2012. It got the attention of a number of media outlets. More importantly, it got the attention of lawyers. Most importantly, it eventually got the attention of intrepid undergraduates in Marc Howard’s class at Georgetown. As part of a documentary they were putting together, the students managed to secure a sit-down interview with Christopher Belling, the retired prosecutor who tried Dixon’s case. In a stroke of irony equal parts poetic and painful, it was Belling who spilled the crucial information that led to Dixon’s release. 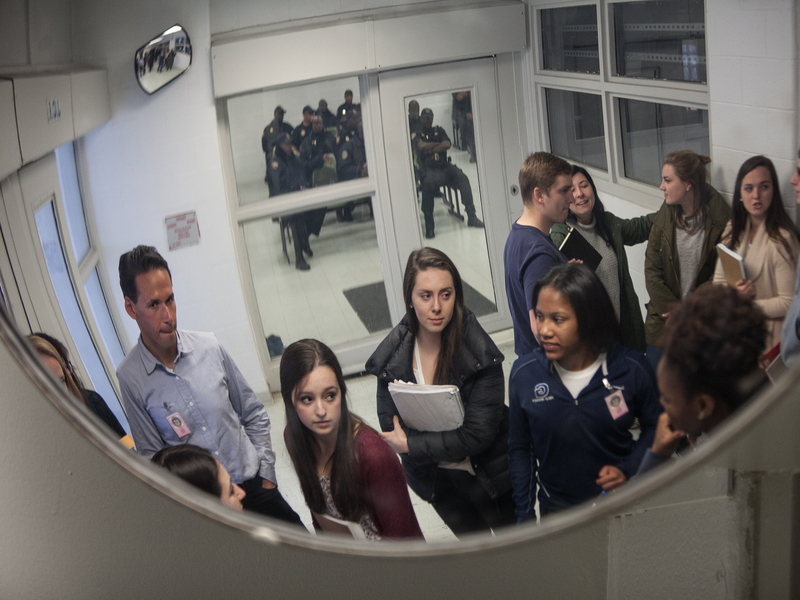 Marc Howard, left, and his Georgetown University students wait outside Jessup Correctional Institution. Howard taught a class to his students and inmates on prison reform. “He’s got this nice suit on and these three students and he’s thinking ‘I’m going to give them a lecture.’ And then they start probing,” Howard says. “They’re asking tough questions. He starts sweating. Squirming. He’s uncomfortable. Because that negative gun residue test result hadn’t been turned over to Dixon’s defense team, Belling’s slip-up was an admission of a Brady violation (a 1963 Supreme Court case established the precedent that the prosecution must turn over all evidence, including evidence favorable to the defendant, to the defense). But that violation alone wasn’t grounds for Dixon to get out of prison. In 2016, Eerie Country elected a new district attorney, John Flynn, who started a Convictions Integrity Unit to investigate possible wrongful incarcerations. Howard’s indefatigable students also managed to interview him—“I love those kids,” Dixon says—and the new D.A. promised to give Dixon’s case a thorough review. He kept that promise. Dixon walked free on Sept. 19, 2018. It was 9,902 days after Torriano Jackson was killed. Former prisoners’ difficulties don’t end when their sentences do. Not even close. It can be borderline impossible for anyone with a record, let alone a murder charge, to find gainful employment. According to the Prison Policy Initiative, the unemployment rate among formerly incarcerated people is a staggering 27%. Valentino Dixon’s case is a bit different, of course. He was exonerated of the crime that put him behind bars. But the criminal past is far from the only reason people struggle to find jobs after leaving prison, especially someone who was convicted when Fred Couples was the No. 1 player in the world and just got out last fall. Languishing in prison can destroy a man’s motivation. Crush his spirit. Wreck his ability to work with others. Not to mention the more practical challenge of trying to navigate an internet-everything world. Dixon asked the man to help him call an Uber. His response? Dixon told him that he was not, in fact, f---ing kidding him, and told him to Google his name. After reading his story, the tone changed entirely. One reason he’s still laughing and smiling: unlike so many others in his position, Dixon has an intact family that actually grew while he was in prison. He also has a career. While in Attica, Dixon became pen pals with an Australian woman who took an interest in his case. She came to visit him and the two fell in love. They were married in 2002, but she was denied a green card because the U.S. citizen she married was an incarcerated felon. She overstayed her temporary visa and has since been banned from entering the United States, though the couple has hired immigration lawyers who believe the issue will be resolved. Dixon met up with her in Mexico after his release and plans on seeing her in the next 60 days. Meanwhile, Dixon has moved back to Buffalo and lives with his mother in the upstairs portion of a modest two-bedroom apartment. He remains close with his daughter, Valentina, who was just four months old when he went to prison. She has since given birth to twins. And the career? Drawing golf courses, of course. Days after he was set free, wives of caddies for the U.S. Ryder cup team commissioned Dixon to draw a picture of Le Golf National, last year’s Cup venue, as a gift for U.S. captain Jim Furyk. He cried upon receiving the drawing. In January, Dixon’s work was well-received at the Outsider Art Fair in New York, a festival spotlighting artists from untraditional backgrounds. Then came the debut solo show at the gallery, where his works ranged from $8,000 to $30,000. Dozens more are available for purchase on ValentinoDixon.com. He’s currently working on yet another commissioned piece, this time for Portland Trail Blazers star Damian Lillard. There are golf clubs in Asia that want to pay him to fly abroad and draw their courses. How the circumstances have changed. The drawings Dixon did in prison are comprised of multiple drawing boards put together like puzzle pieces. He didn't have the space to draw on large pieces of board while inside Attica. Art aside, Dixon has also deepened his relationship with the sport he’ll forever be linked to. After his release, he played golf for the first time with Adler, the man who helped set him free, in Mexico. 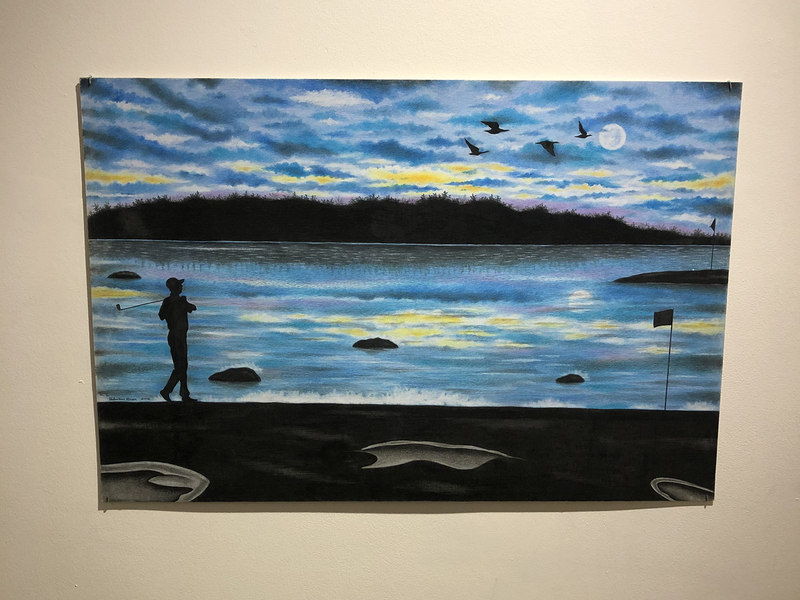 Next month, Golf Digest is sending him to Augusta—the inspiration for his first golf drawing—as part of its “My First Masters" series, where non-golf writers document their first experience at golf’s most iconic tournament. Dixon will have another chance to draw that 12th hole. Back then, from a prison cell. Now, in person. Full circle. A demented, twisted, awful circle. But a full one nonetheless.